The institution’s visionary awards showcase talented individuals who are inspiring change and driving innovation forwards. Philip studied Manufacturing Engineering (MET) at the IfM from 2008-2010. He was recognised not only for his strong academic achievements whilst at Cambridge, but also for his work in industry. As well as the industrial placements forming part of the MET course, he completed two summer internships with Rolls-Royce working firstly for its air safety investigation team before working as an engine design engineer for the Ministry of Defence. Philip now works offshore for Shell in the Dutch North Sea. 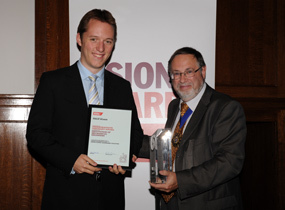 More information about the Vision Award.